•The fundamental idea of the tracer technique is simple and clear. •water is “marked” with the aid of a tracer and its propagation is followed. •Tracing techniques can be used in all types of hydrological and hydro geological environments to obtain information about water movement and contaminant transport. •water tracing was initially developed for the investigation of karst aquifers. it involves the use of naturally occurring components of a water sample to determine information about the source and age of the sample. Used in case of age-dating. Environmental isotopes are now used to trace not only groundwater provenance, but also recharge processes, subsurface processes, geochemical reactions and reaction rates. 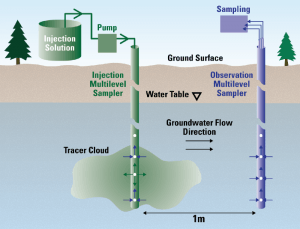 they can be used to evaluate the extent to which aquifers interact with surface water features, providing information on groundwater flow paths, travel times, velocities, dispersion, flow rates and the degree of hydraulic connection. they should have low toxicological impact. This differs from natural tracers methods which rely on the measurement and interpretation of background concentrations of the chemical constituents of water, such as major ions, stable or radioactive isotopes. •Groundwater, in its natural state, contains environmental isotopes and conclusions may be drawn from the distribution variations. •The distribution of the stable isotopes, deuterium and oxygen-18, of groundwater correlated with average isotopic data of precipitation define the origin and movement of subsurface waters. •Radioisotopes, such as tritium, provide valuable information on recent recharge whereas carbon-14 data show slow-moving groundwater. •The use of isotope techniques which complement hydrochemical and hydrogeological studies should be encouraged in both surface water and groundwater resource development. Category: Civil Engineering Articles Civil Engineering Articles for Mobile PowerPoint Presentations Water Resource Engineering Tags: Alluvial aquifers, contaminated water, contamination of water, ground water and surface water, ground water ppt, groundwater contamination, groundwater recharge estimation methods, Groundwater tracing, Hillslope groundwater and fractured aquifers, Karstic aquifers, Natural And Artificial Tracers In Ground Water, pollution of water, Tracer tests, Type of Tracers, water contamination, water quality parameters, water quality standards, waterpollution, Why is tracing important? 1.3 Why is tracing important?